polycarbonate corrugated sheet of WEIERSHA be formed with complete new pc sheet raw materials offered by Bayer Macrolon, GE lexan etc, contained anti-ultraviolet absorbent, adopting European co-extrusionand technology and equipments. 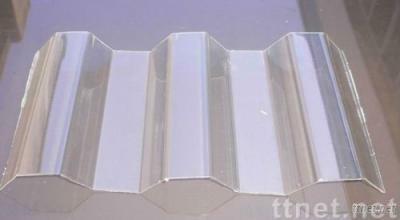 Specification of polycarbonate corrugated sheet: Thickness 0.8~2.5mm, can be by client. Length sheet be 5.8, 11.8m length, , can be by client either. Width 760mm, 820mm, 840mm, 930mm, 860mm, max to 1050mm, can be by client either. Colour Clear, Transparent, Transparent-blue, Transparent-green, Coffee, Opal, can be by clients either. Polycarbonate corrugated sheet application 1-Day lighting for building roofing/wall; 2-Decorating, advertising, Display Design; 3-Sound insulation wall for expressway, environment; 4-Roofing/wall for agricultrure greenhouse, garden, plant and cultivate; 5-Part of machine, electron, household electrical appliances equipment.